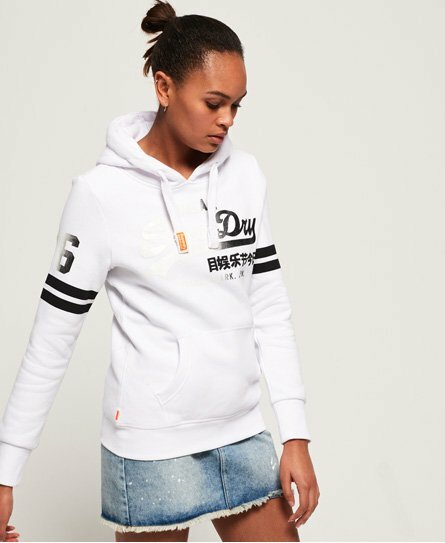 Superdry women's Vintage Logo fade hoodie. Keep it casual this season with the Vintage Logo fade hoodie, featuring a drawstring adjustable hood, a front pouch pocket and a ribbed hem and cuffs. This hoodie also features an ombre Superdry logo across the chest in a glitter finish and a stripe design on the sleeves in a cracked effect. This hoodie is finished with a number graphic on the sleeve, a Superdry tab in one side seam and the signature orange stitch in the other.